It can be tough to pick out the right guitar strings, especially if you are just starting out. There are many things to take into consideration and many string models to choose from. Stick with me as I dig into the gauges and alloys to find the best guitar strings for beginners. How to Change Strings on an Acoustic Guitar? How to Change Strings on an Electric Guitar? If you’re having trouble picking out the right set of strings for your acoustic baby, take a look at my favorites. 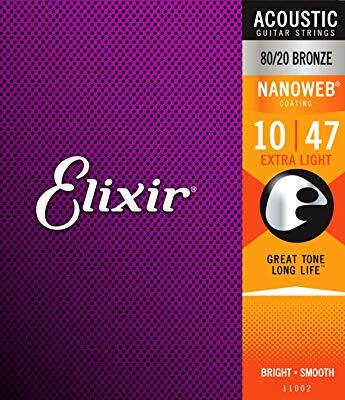 Elixir’s 80/20 Bronze Nanoweb extra-light strings are made of the most popular bronze alloy (80% copper, 20% zinc) and coated in Elixir’s famous Nanoweb. The 80/20 Bronze Nanoweb strings are of “extra light” .010 gauge. The low E string is the industry standard .047. Elixir also offers other gauges and configurations of the 80/20 Bronze Nanoweb strings. As with all bronze strings, these offer a bright, ringing tone, excellent for players aiming for a bold sound with a lot of presence. C.F. Martin & Co is one of the world’s premier acoustic guitar manufacturers, with almost 200 years of tradition (established in 1833). 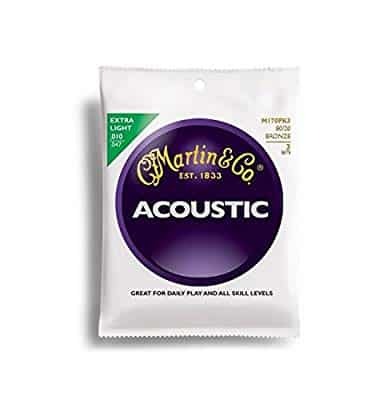 The M170 80/20 acoustic guitar strings are my favorite Martin strings. The extra light gauge (.010 to .047) is great for beginners and players who prefer finger-picking style. They are made of Martin’s signature 80/20 copper/zinc alloy and offer a bright, spacious tone with pronounced clarity. On the downside, they are more prone to oxidization than brass and steel strings. Martin offers the M170 in other gauges and configurations, as well. These strings are best used on small and medium-sized acoustic guitars, as they put a lot less tension on the neck than their .012 or .013 siblings. That being said, I also recommend these for solo performers and acoustic duos. Whether you’re buying an acoustic or electric guitar, it will most likely be shipped with a set of D’Addario strings. That says a lot about the brand’s prominence and position on the market. However, here are my favorite D’Addario strings – the EJ26-3D 11-52. The EJ26-3D 11-52 strings are one of the best acoustic guitar strings for beginners, as they offer great balance between playability and strength. They are .011 gauge, with the low E string at .052. 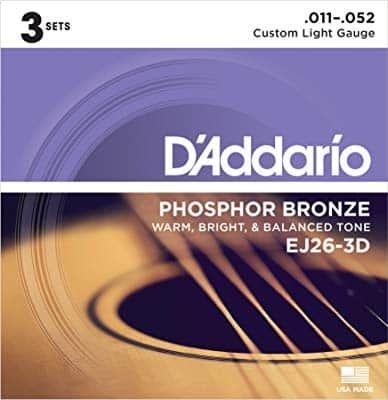 D’Addario offers the EJ26-3D in several other 6 and 12-string variants. These strings are made of phosphor bronze alloy and offer a slightly darker tone than their bronze counterparts, landing around the middle of the dark-warm spectrum. This makes them musical chameleons, giving them unparalleled versatility. I've listed three of my favorite electric guitar strings below, which are perfect for beginners as well as experienced players. 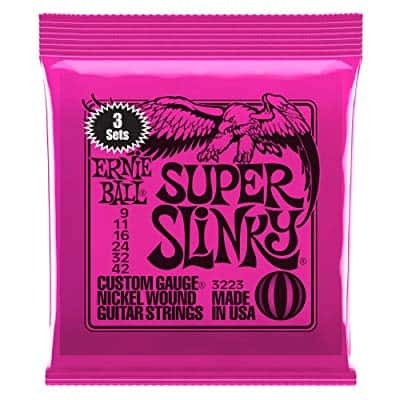 Ernie Ball’s Super Slinky strings are my personal favorites in the electric guitar segment. They are one of the best electric guitar strings for beginners, and work well for a wide variety of styles. These Super Slinkies comes in at the standard .009 gauge on the high E string. The low E string is at .042, A string is .032, D is .024, G is .016, and B is .011. This is the most standard configuration for the 9-gauge strings. Note that the Super Slinky is part of the Slinky family of strings which comes in a huge variety of gauges and configurations. The lower (thicker) strings are made of nickel-wound steel and have hex-shaped cores. The high (thin) ones are made of carbon-rich steel with tin plating. They have a good balance of warmth and brightness, and an aggressive attack. Angus Young, Jimmy Page, and James Hetfield are among the most prominent players that use these strings. If you’re looking beyond guitar manufacturers for a set of strings, D’Addario might be the brand for you. The EXL120-3D is one of several super-light gauge options they offer. For this set, the high E string is .009 gauge and the low E at .042. The strings are made of nickel-plated steel, with the lower strings featuring the roundwound styling. 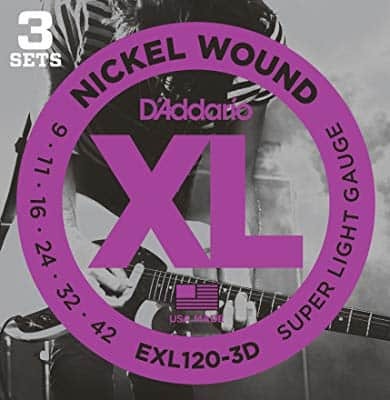 D’Addario makes the EXL120-3D strings in several other gauges, as well. These strings sit in the middle of the brightness-warmth scale and are characterized by a snappy response. This makes them suitable for more aggressive styles, though they can hold their own in clean and mellow passages. Like many big guitar manufacturers, Fender also makes strings. They have both acoustic and electric guitar strings. Their range of electric guitar strings spans a wide array of models, covering pretty much everything from jazz and blues to hard rock and metal. The Super 250R strings are versatile and light enough for beginners. The rest of the 250 range comes in the following gauges: .08 – .038 (XS), .009 – .042 (L), .009 – .046 (LR), .010 – .052 (RH), .011 – .049 (M), and .012 – .052 (H). The Super 250 strings are made of nickel-plated steel for a good blend of warmth and brightness and an even amount of highs and lows. The nickel-steel alloy gives them a sharp response and attack. If you opt for these, choose the gauge according to your preferences and needs. String gauge is a measurement of the thickness or diameter of the strings. The gauge of a particular set, be it a set of electric or acoustic guitar strings, is determined by the thickness/diameter of its thinnest string. For example, the thinnest string of a set of nine-gauge strings (often referred to as “9s”) will have a diameter of 0.009”. Acoustic guitar string gauges typically range from 0.010” to 0.014”, though thicker and thinner sets do exist. The “10s” are often referred to as “extra light”, with “14s” being considered “heavy”. Some manufacturers, for example, refer to 0.011” string sets as “custom light” and 0.012” sets as “light”. “13s” are often considered “medium”. If you intend to use the fingerpicking style, you should go with thinner strings, as they are easier to play. Also, they allow you to fret and bend the notes more easily, and put less pressure on your guitar’s neck. On the flipside, they are easier to break and give less sustain and volume than their thicker siblings. If you play with low action, they are more likely to cause fret buzzing. Heavier strings are, on the other hand, the preferred choice among players who use the strumming technique. Heavier strings offer more sustain and volume, and are harder to break. They require more strength in your fretting hand and put more pressure on the neck. Heavy strings also provide enough tension to support low and alternative tunings, such as drop D, Open D (often referred to as DADGAD) and drop C. Some players, like Tommy Emmanuel and Leo Kottke, prefer heavier strings. 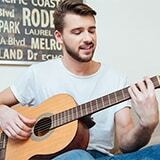 The size of the body of your acoustic guitar should also play a role in determining which strings to buy. Guitars with smaller bodies like parlor (also known as New Yorker) and 00 should be strung with lighter gauge strings, while auditorium, dreadnought, and jumbo-sized models can support heavier strings. 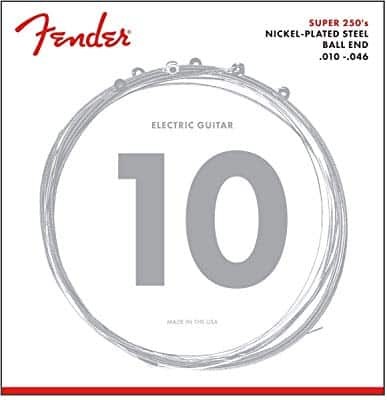 Electric guitar strings usually range from .08 to .012. Of course, there are string sets outside this range, though new electric guitars are most commonly shipped with .009 gauge strings. Electric guitars tend to have lighter strings than the acoustics because they rely on pickups for volume and sustain. There are several factors that you will need to consider when buying electric guitar strings. They include the style of music you play, the tone you are aiming for, and the strength of your fretting hand. You should go with light strings if you aim for a lighter tone and don’t want to fatigue your fretting hand too much. Also, if you play a lot of leads and melodies, you might want to consider lighter strings. The way to remedy this if you are in a hard rock/metal band is to install stronger pickups or use more gain. For example, Yngwie Malmsteen plays on .007 strings. You should go with the heavier strings if you want a beefier tone and don’t mind the extra effort. Heavy strings are great for rhythm duties and for riffs and chording. Also, heavier strings will allow you to tune your guitar low. A set of “11s” will easily go down to Drop B – the main tuning of Machine Head and other modern metal bands. It is worth noting that some prominent lead guitar players (like the late Stevie Ray Vaughan and Dimebag Darrell) prefer heavy strings. If you have a short-scaled guitar, like the Fender Mustang (24” scale), you might want to consider lighter strings. If, on the other hand, you play a baritone-scale guitar (27” and upwards), heavy-gauge strings are a must. Standard-scaled guitars (24-3/4” - 25-1/2”) work best with medium-gauge strings. String material plays a significant role in the tone of your acoustic guitar. Common materials include aluminum bronze, brass, bronze, phosphorous bronze, polymer-coated, and coated steel. Here are the main characteristics of each material. Strings made of aluminum bronze have a strong low end. This is great for if you don’t have a bass player, i.e. if you are a solo performer or play in an acoustic duo. Also, they provide clear highs and a decent midrange. Brass strings are on the bright side and have a jangling tone. You should go for brass strings if you want to play rockabilly or similar types of music. Bronze strings are on the bright side, as well. They give a clear and ringing tone. On the downside, they tend to have a short life span due to oxidization. Great for settings where you need a clear and punchy tone. Phosphorous bronze strings utilize phosphor to stave off the oxidization. In turn, they have a darker and warmer tone than their bronze and aluminum/bronze counterparts. These are very popular with players who use strumming technique, especially country and blues players. Strings with polymer coating are corrosion free, which is their main strength. Usually, they will have a warmer and darker tone than their uncoated counterparts. It is not uncommon to see colored polymer-coated strings. Coated steel strings usually feature silk wrapping around the steel core of the lower strings. Other wrap materials such as copper or nylon are available as well. These strings give a mellower, darker tone. Recommended for country and blues, as well as vintage guitars which can’t handle high-tension strings. Electric guitar strings have less impact on the tone than their acoustic counterparts, as the tone of electric guitar is largely shaped by pickups and amplifiers. The most popular materials include stainless steel, chrome, cobalt, nickel-plated steel, titanium, and pure nickel. They can also be polymer-coated, as well as color-coated. Here are the main characteristics of each material. Stainless steel strings are rust-resistant and offer a crisp tone with loads of sustain. They are on the bright side and produce less noise when you move your fingers across hem. Good for more aggressive styles and genres. Chrome strings are the favorite weapon of many blues and jazz players. They produce a darker, warmer tone and have less sustain and resonance. Cobalt strings are notable for their brightness and responsiveness. They are a good choice if you’re aiming for a bold, “in-your-face” tone. Nickel-plated steel strings are there for players who want a balanced tone, not too bright and not too warm. These strings also have more attack, meaning the notes will sound more aggressive and pack a stronger punch. Titanium is another common electric guitar string material. Strings of titanium are noted for their strength and brightness. Pure nickel strings are notably darker and warmer than their siblings of nickel-plated steel. They also offer less attack. Polymer coating dampens the sustain of strings and makes them rust-resistant. Some guitars and basses, like Dean’s Custom Zone models, might come with colored strings. The characteristics depend on the string material. Learning how to change strings is as important as learning how to play. The most common tools you will need to get the job done include string clippers, string winder, and new strings. Make sure you change one string at a time in order to retain tension on the neck. Take a string winder and loosen the tuning machine. If you don’t have a string winder, do it manually. Once the string is completely loose, unwind it from the tuning peg. Optionally, you can clip it in half before unwinding. Pull the bridge pin out of its socket and take the string out. Take a new string and insert the ball-end into the string pin socket. Put the string pin into the socket to secure the string. Thread the other end of the string through the peg. Make sure you do it from the center of the headstock. Wind the tuner. No need to tune the string to its correct pitch at this moment, just wind it until it is approximately as tense as the other strings. Make sure that the windings on the tuning post go downwards and don’t overlap. Repeat for the remaining strings. Here’s a good video tutorial on how to change acoustic guitar strings. Electric guitars come with a huge variety of bridges. While the basic process of changing strings is pretty similar across the board, it may differ slightly for different types and models. Here’s the general guide. Loosen the tuning machine of the string that you want to change. If you have a locking nut, make sure to loosen it before the tuner. Unwind the string from the tuning machine. Pull the string out of the bridge socket. If you have a Floyd Rose or Ibanez Edge-style locking tremolo bridge on your guitar, you will first need to unlock the string socket with an Allen wrench. If you have a string-through-body bridge, pull the string out from the back of the guitar. Insert the new string into the socket. If you have a locking tremolo bridge, lock the string socket with an Allen wrench. If you have a neck-through-body bridge, insert the string through the hole in the back of the guitar and through the string socket on the bridge. Thread the other end of the string through the tuning peg. Make sure to do it from the center of the headstock. Wind the tuner until the string has the same or similar tension as the other strings. Don’t lock the locking nut until you have changed all the strings that you want to change. Repeat the process for the remaining strings. If your guitar has a locking nut, tighten the screws with the Allen wrench. Be careful not to overdo it, as you might damage the nut or break the strings. Fine-tune the guitar at the bridge. There are numerous options in guitar strings out there, for both acoustic and electric guitars. That being said, knowing your genre and style as well as the basic characteristics of your six-string companion can help a lot in choosing the best guitar strings for your axe.